One Year After Sandy Hook: How Many Gun Deaths? | Addicting Info | The Knowledge You Crave One Year After Sandy Hook: How Many Gun Deaths? One Year After Sandy Hook: How Many Gun Deaths? You would think it an easy question to answer. How many gun deaths have there been in the United States since the massacre at Sandy Hook Elementary School? You would think it an easy question to answer. How many gun deaths have there been in the United States since the massacre at Sandy Hook Elementary School? From Dec. 15, 2012 to Dec. 14, 2013, 365 days, how many times has a person died from gun violence? There is no definitive answer. Being as the year is not over and the statistics on gun deaths are not kept in one central location. Plus, the general public is not exposed to every episode involving gun death in the country. That makes the task of tallying the carnage almost impossible. For the purpose of this article I’m going to throw a lot of numbers at you. When we’re done I hope to condense this data down to a number that makes sense to all. In the process, several links will be available for you to stay current with not only statistics but efforts to combat an issue that is a centerpiece of public and political debate. It’s almost impossible for an individual to tally all the death in the U.S. from gun violence. Suicide, murder, mass murder, accidental, police violence and no one keeps an accurate count. There is no central location for reporting gun violence in your city. Slate.com is trying to change that. The compelling thing about this running tote board of death are the sheer number increases. From beginning to end of the writing of this piece more than 100 people have been killed by gun violence. That is a traceable number. Weigh that against how you spent your weekend. Check out Slate.com today while you go about your business. Write down the number. Come back next week and see how much that number grew in one week of your existence. Compare that to how many gun related stories you may have seen or heard on the news and the weight of the issue becomes burdensome to one’s conscience. Want to get involved? You can. Check the links above and below to find out how. The number of children killed by guns. David Corn’s outfit Mother Jones has written an article on the number of children killed by gun violence this year. It’s a good one. While admittedly incomplete, the numbers presented and pictures painted are shocking, infuriating and saddening. 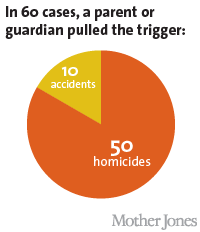 Mother Jones’ Mark Follman looks at gun deaths in children aged 12 and under. At the time of publication, 194 children aged 12 or under had been killed by guns. That’s more than one kid every other day! Of those 194 over 100 were murdered. Of that 100, over 50% were by the hands of their own parents. That’s one child gun death a week, every week at the hands of their parents! The average age of child gun deaths? 6 years old. Perspective on child gun deaths. There are more children under the age of 12 murdered by their own parents with a gun in the United States than all the murders across the entire continent of Australia(30). The U.S. has more gun deaths in children under the age of 12 than the total number of murders in England (41), Finland (24), France (35), Ireland (21), Israel (6), Japan (11), Jordan(26), South Korea, (14) and Lebanon (31) combined. How’s that for perspective? Why is it so difficult to put together a definitive number to such a clearly defined issue? President Obama’s involvement is, of course, a source of fuel for the hatred and disinformation spread by the right, led by the NRA. No one wants to remove our 2nd amendment right. That argument has been shot full of holes. To fight against the collection and/or release of data involving guns in any capacity is counter productive. What is it they don’t want the American people to know? The right argues more guns owned means less gun death. The United States has more guns total (and per 100k people) than any other country on earth. It’s not even close. The United States also has more gun deaths total (and per 100k people) than any other country on earth. That’s not even close either. How’s that for defeating the right’s argument? It’s a common sense statistic. More guns and exposure to guns means more likelihood of gun violence. Why fund a study? Just look at the data we already have that’s incomplete by design. They try to keep the issue silent but the truth is out. We own the most guns privately. We have the most gun deaths annually. What more do you need to know? The best numbers we have for gun deaths this year. Center for Disease Control (CDC): estimates 32,873 gun deaths in 2013. More than 90 gun deaths a day, every day, for the entire year. Three times the number of homicides by gun in all of Australia for the entire year. Every. Single. Day. 2010 reports from the CDC show a total of 30,470. 11,078 homicides, 19,392 suicides. One would think the statistics from the CDC are where you could find the most accurate data. And it is. But consider those 90 gun deaths a day divided across all 50 states. Couple that with the obstruction by extremists and you begin to see the difficulty in compiling accurate figures. The CDC is the best source on gun death but their reports don’t come out until the year after at least. The delay in up-to-date data by those opposed to reform and regulation creates a smoke screen. By denying you the figures, the gun lobby performs a sleight of hand and insulates themselves against fact. The Brady Campaign to Prevent Gun Violence has some very interesting factoids on gun deaths. The perspective they lend answers the question of why does 90% of the population (including 75% of NRA members) support common sense gun regulation. One in three people in the U.S. know someone who has been shot. Although guns can and have been used successfully in self-defense in the home, a gun in the home is 22 times more likely to be used to kill or injure in a domestic homicide, suicide, or unintentional shooting than to be used in self-defense. •Youth (ages 0 to 19) in the most rural U.S. counties are as likely to die from a gunshot as those living in the most urban counties. Rural children die of more gun suicides and unintentional shooting deaths. Urban children die more often of gun homicides. Nine out of 10 Americans agree that we should have universal background checks, including three out of four NRA members. Since the Brady Law was initially passed, 3-1-1994 thru 12-31-2010, about 2.1 million attempts to purchase firearms have been blocked due to a background check. About half of those were felons. Unfortunately, our current background check system only applies to about 60% of gun sales, leaving 40% (online sales, purchases at gun shows, etc.) without a background check. Gun death among civilians compared to military personnel. The Department of Defense reports for all military personnel in all Middle East war operations including Operation Iraqi Freedom (Iraq war), Operation New Dawn and Operation Enduring Freedom (Afghanistan war) are; killed in action (KIA) 4423 + 66 + 2288 = 6,777. Wounded numbers 31,942 +295 + 19,514 = 51,751. Keep in mind that these statistics include more than just gun violence. The gun deaths at home this year are 5 times the amount than ten years of military conflict on multiple fronts . Personally, that tells me that the general public needs much greater scrutiny and training to responsibly own firearms and reduce the amount of gun death in the U.S.
Has 30,000 gun deaths resulted in any gun law reform? The answer to that question is yes. However the debate will continue on whether the changes are meaningful or if there have been enough of them. Media Matters has reported on all the gun law reforms that have occurred since Newtown. To date there have been 23. None of them are the sweeping reforms that 90% of Americans support but there is a strong possibility that the issue of gun law reformation will once again come up for a vote in 2014. Hopefully, the anniversary of the Sandy Hook shooting will help to prioritize the passing of comprehensive common sense federal legislation. Individual states have made more progress. California, Colorado, Connecticut, Maryland, New Jersey, New York and Virginia have all taken large steps to curb gun deaths since Newtown. The small percentage of states making reforms and the differences in those reforms from state to state only emphasizes the need for federal uniformity in combatting gun death and violence. Where can you find information on gun death? If you want to track information, learn about legislation, participate in polling or become active in the fight against gun deaths in America you can use the resources listed below. The final numbers on gun death. At the beginning of this article I told you I was going to throw a lot of numbers at you. The 33,000 gun deaths from the CDC and Slate estimates. The 11, 435 actual confirmed from Slate and @GunDeaths. The 194 children killed by guns from Mother Jones. Or the 90 Americans killed every day. The 23 reforms from Media Matters. Or the 1500 state bills from the Washington Post that we haven’t even talked about until now. If you add all those numbers from all those sources together and use every link to study the issue in depth you inevitably come to a single conclusion. We, as a country, cannot continue to ignore this problem any longer. 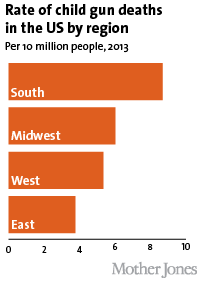 Gun death in the United States has reached epidemic proportions. Even if the call for change has not reached critical mass. The common denominator is, and always has been, one. What can you, as an individual, do in contribution to lessen the damage done by guns every day of every week of every year from this point forward? Use the anniversary of the Sandy Hook slayings to re-energize your knowledge, position, and activism opposing gun death. It doesn’t have to happen. It hasn’t always been like this. We don’t need to ban guns or abolish amendments. We only need involvement. One voice. One vote. One democracy minus special interests multiplies common sense. The final equation becomes one nation, indivisible.